Shipka SMG in 9x18 Makarov. Caliber: 9x18mm Makarov; 9x19mm Luger/Para Weight: 2.0 - 2.2 kg withouth magazine Lenght (stock closed/open): 338 / 625 mm Barrel lenght: 150 mm Rate of fire: 700 rounds per minute Magazine capacity: 32 rounds (25 rounds for 9x19mm) Effective range: 150 meters The "Shipka" SMG was developed by Bulgarian company ARSENAL for police and military use, and currently is offered for export. It appeared on the market circa 1996. According to some sources, it is used by Bulgarian police and security forces. "Shipka" (named after historical place in Bulgaria) is a straightforward design, using simple blowback operation and firing from open bolt. 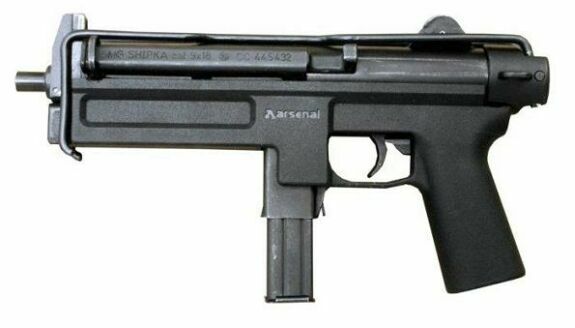 The lower receiver along with pistol grip and triggerguard is made from polymer, the upper receiver is made from steel. Simple buttstock is made from steel wire and folds to the left side of gun.